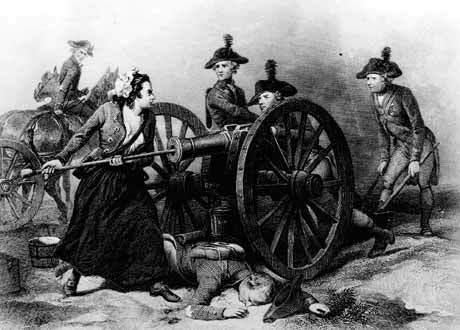 During the battle Molly Pitcher, the wife of an American gunner officer, is said to have taken over the firing of her husband’s cannon, when the crew became casualties. Henry Wyatt was born in 1759 in King and queen City, VA.
Henry served in the 7th VA Regiment “under Colonel Health of the Continental Line under Captain Hill for 1 year”. “General Washington, bringing the main American army along the Monmouth road, encountered, not the rear of the British column, but Lee’s regiments, retreating in considerable disorder with the British advancing behind them. Memorably this is the one occasion Washington is said to have sworn. He deployed a consignment of oaths directed at Lee, to the admiration of those listening, before ordering Lee to the rear. Washington then galloped forward and began the task of rallying Lee’s disordered troops. Some US authorities categorise Lee as a traitor. Lee is a strange and interesting character. He first arrived in America as a captain in Halkett’s 44th Regiment, taking part in Braddock’s disastrous march to the Ohio River during 1755. Lee continued to serve during the French and Indian War. He was given the nickname of “Boiling Water” by the Iroquois due to his temper. He was also the subject of an assassination attempt by members of his regiment. Overall, the battle was considered a bit of a wash with no real victor. After the war Henry married Elizabeth Redd on June 9, 1787 in Spotsylvania. VA. “Cousin” Bonnie Snow provided the following – thank you Bonnie! Know all men by these presents that we Henry Wyatt and P.D. Redd are held and firmly bound unto Sam’l Randolp Esq., Governor of this state and to his successors in the sum of fifty pounds to the payment of which will ( ) to be made, we bind ourselves jointly and severally firmly by these presents. Sealed this 11th day of June 1787. The Cond’n is such that whereas J. Chew Jr. clk of the County Court of Spotsl. hath this day issued a license for the marriage of the above named Henry Wyatt unto Elizabeth Redd of the said County. Now if there be no lawful cause to obstruct said marg’e and then the above obligation to be void. As I understand it, Revolutionary War veterans were given land in Kentucky. Henry Wyatt moved to Pendleton County in the early 1800s. He had a plantation of approximately 500 acres. Henry Wyatt applied for his Revolutionary Pension (W-836) in Pendleton County, Kentucky on October 19, 1819. His stated age was 60 years old and he reported serving in King & Queen County, Virginia. He died October 4, 1824 in Pendleton City, Kentucky. At the time of his death he left 8 slaves, 325 acres of land – and a widow who had to fight long and hard to get his pension. I have to advise you that is appears from the papers in the Revolutionary War pension claim, W. 836, that HENRY WYATT enlisted in King & Queen County, Virgina, in 1777 and served on year as a private in Captain Thomas Hill’s Company in Colonel Heth’s Virginia Regiment and he was in the battle of Monmouth. He was allowed pension on his application executed October 19, 1819 at which time he was sixty-six years of age and was a resident of Pendleton County, Kentucky. He died December 27, 1823. He married in 1787 in Spottsylvania County, Virginia, Elizabeth Redd. She was allowed pension on her application executed November 1, 1837, while a resident of Pendleton County, Kentucky, and at that time she was over seventy years of age. Henry and Elizabeth Wyatt had the following children: Mordecai who was the oldest, Parmelia, James, Philip, Betsey, Henry, Nancy, Agnes, Beverly, John and Sally. Emily Permelia Wyatt (noted in the Revolutionary pension document) was born about 1795. She married Moses Simpson and one of their children was Martha Simpson, born in 1827. She married Josiah F. Tinney on October 19, 1841. Josiah was in the War of 1812. Their son John Henry Tinney was in the Civil War. Martha’s letter to her son at this time is heartbreaking. See my other post for details. If you have information to share, please contact me!! !